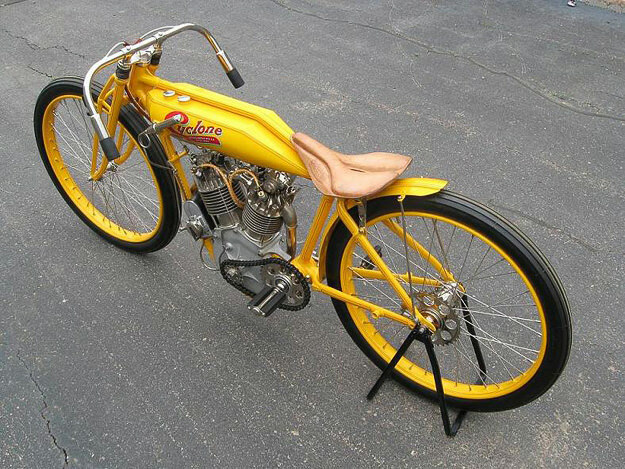 This is the Cyclone Board Track Racer, a 1915 motorcycle that sold for $520,000 in July 2008 at the inaugural Monterey MidAmerica auctions. Yes, what you see here is The World’s Most Expensive Motorcycle. It was an auctioned bike, but I always thought an auctioned Vincent or Brough Superior would be the holder of the dollar record. The Cyclone was designed by Andrew Strand, a Swedish-born engineer, and made by the Joerns Motor Manufacturing Company of St. Paul, Minnesota. Being a track racer, we’re looking at a very basic and lightweight machine, complete with low, scooping handlebars and no brakes whatsoever. The engine features shaft-and-bevel driven overhead cams, technology that was way ahead of its time in 1915. Some other features are strangely contemporary too, such as the near-hemispherical combustion chambers. The Cyclone also has roller bearings and balls which were properly caged. The V-Twin engine was quite powerful: its maximum power output is given as 45 horses, an amazing figure for almost a century ago. It cost a great deal of money to built such a refined machine, and very few were made during the two years of production. Only twelve Cyclones have resurfaced over the years, and some of those are road-oriented bikes. Still, what made it such a huge hit at the auction? Well, aside from its rarity, the Cyclone has been described as one of the most ‘correct’ board track racers, with the correct engine internals. Incidentally, the Cyclone was formerly the property of ‘Shorty’ Tompkins, a collector of rare vintage bikes, who also owned the very rare 1914 Pope Motorcycle.